The Mickey Party Time event trailer kept the beer cold and the lines short at the 2016 National Folk Festival. 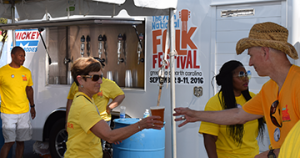 More than 138,000 people attended the 2016 National Folk Festival in Greensboro, NC from September 9 through 11, 2016, topping 2015 attendance by 40%, according to Festival co-producer ArtsGreensboro. With temperatures hovering in the mid-90s on all 3 days of the Festival, the throng of thirsty revelers gulped down 25% more icy cold beer than at the 2015 event thanks in large party to Mickey Truck Bodies’ new “Party Time” event trailers. 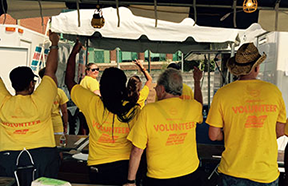 Every Festival volunteer wore a tee shirt featuring the Mickey logo. The free event is America’s longest-running festival of traditional arts. Approximately 300 artists—musicians, dancers, storytellers, and craftspeople—participated in the National Folk Festival, with 122 separate performances by more than 40 different artists at eight outdoor performance venues. Mickey had a major presence at the 2016 Festival. As the official sponsor of the event’s volunteer tee shirt, the Mickey logo was prominently printed on the back of every tee shirt worn by Festival workers. In addition, 12 Mickey units were on the grounds throughout the 3 days, including 9 van bodies in addition to the 3 keg trailers with a total of 30 taps for dispensing cold draft beer. The Mickey logo, along with the Folk Festival logo, were decaled on all the units. Click HERE to view a video of the Mickey Party Time event Trailer at the 2016 National Folk Festival.